In his match against Marn, Punk went for a teabag taunt as Karin. That’s about as intense as things got. The third season of TBS’ esports tournament is the first to feature a fighting game. Judging by yesterday’s premiere online broadcast, which will lead into televised episodes, it’s got problems. So far, it’s too quiet, too subdued, and too weirdly structured to work well as a fighting game event. The first two seasons of Eleague featured the first-person shooter Counter-Strike: Global Offensive. They’re doing Street Fighter V this year. This new season revolves around a Street Fighter V competition featuring famous pros (such as Daigo Umehara and Justin Wong), celebrity picks who probably won’t win the whole thing but will be fan favorites (such as Street Fighter veterans like Alex Valle and Ryan “Gootecks” Gutierrez, both now better known as commentators rather than active players), and players who are a mix of both charismatic fighting scene celebrity and actual SF chops (like Ricki Ortiz and Xian). It’s an invitational tournament, and the final rounds will be broadcast on television, so it makes sense that Eleague would want to choose players who can ham it up for the camera, as opposed to picking a roster solely based on skills. As soon as I saw the roster announcement, though, I had my doubts. The whole idea of a corporatized, televised SFV tournament geared towards a North American audience sounded risky to me. I wasn’t worried about Eleague botching the proceedings; I figured they’d enlist key fighting games personalities to help them organize the event and that their high budget would allow the tournament to feel streamlined, entertaining, and maybe even a little bit like a reality show. I expected that to be controversial, maybe even unpopular, with the average fighting game fan, given that fighting games rarely end up appearing in high-budget televised championship events. The fighting game community (FGC) seems more at home with its locally organized, raucous underground tournament circuit. Still, I did expect Eleague’s foray into fighting games to be fun to watch, albeit different. It’s been downright polite so far. Instead, Eleague has made for uncomfortable viewing, thanks to some strange missteps right out of the gate at yesterday’s preliminary matches. Prelims got streamed on Twitch and YouTube; the televised portion of the event will happen every Friday night, starting this Friday. The show will also televise the semifinals and the final championship round on July 29 and 30. Hopefully, by that point Eleague will have worked out the kinks. But, so far, Eleague seems clueless on how to organize a fighting game tournament in an entertaining way. Eleague’s staged setup is inherently different from a typical local FGC tourney. It’s made for TV, there’s a lot of money and sponsorships on the line, the stakes are high. But the results feel lifeless so far, perhaps because there’s no live audience. Not yet, anyway. 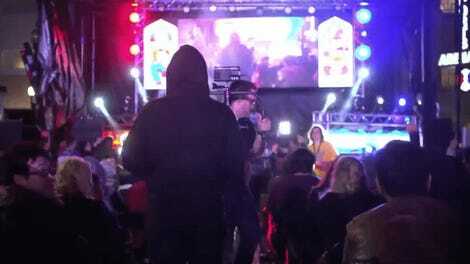 Fighting game events are usually noisy and raucous (usually). Eleague will be inviting a live audience to broadcasts, but only for the Friday night televised events. The online-only broadcasts that unfold during the week will be devoid of audience jeers and cheers, and without that excited presence, the matches feel understated. Players have not been getting in each others’ faces while a screaming crowd eggs them on. It’s been downright polite so far. The commentators’ vibe at Eleage is definitely more subdued than standard fighting game commentary. Take, for example, these clips of “the Steves” (Steve “Tasty Steve” Scott and Stephen “Sajam” Lyon) commentating on some of Punk’s matches yesterday. These two longtime fighting game commentators seem to be lacking their usual verve. During this face-off between Punk and Momochi, the pair sounds oddly understated. There’s a raucous “what” from both of them at the end of the match—but after that, they reel it back in, their voices cracking hesitantly. Even more notable, though, is this moment in a match between Punk and Marn, which features some very showy taunting between the players. The commentators seem unsure how to react to this display; should they encourage it, or shut it down? Tasty Steve quips, “Somebody check the rulebooks, because that was definitely a teabag.” Sajam interrupts by shouting, “Eeeesports! What just happened!” The subtext here is that since this invitational is part of the “esports” brand (“eeeeeesports!”), it’s not clear if players are allowed to engage in this type of behavior. “That’s not what people came to see,” Tasty Steve repeats, twice. There’s an ongoing tension with the FGC’s relationship to “esports” as a concept. This interaction is an acknowledgement of the fact that this event is different. It’s more corporate and more structured, as well as more visible thanks to the televised portions of the event. Perhaps these two commentators simply have a case of the nerves over the structure of Eleague. After all, this competition is requiring them to do more commentary than they’d ordinarily have to. It’s too much. Eleague emphasizes commentary in favor of anything else that would heighten the excitement of the tournament. In between matches, the commentators get several minutes to regroup and recap what just happened. In Counter-Strike, that choice makes sense. Matches are longer and more involved, plus there’s a high chance that some cool plays got missed and need to be reviewed. In Street Fighter, though, it’s way more commentary than anyone needs, so the commentators end up spinning their wheels and repeating themselves. This is a structural choice that illustrates Eleague’s lack of experience with organizing a fighting game event, as opposed to an event for a team-based shooter with longer matches. What’s also weird is Eleague’s overall emphasis on commentary in favor of anything else that would heighten the excitement of the tournament. 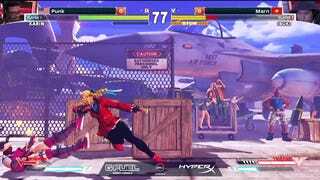 For example, Eleague has lowered the volume of SFV’s music. You can still hear characters’ attacks and efforts, but the music has been turned way down. It’s still there, it’s just playing very faintly in the background, presumably to invite viewers to focus more on the spoken commentary during matches. Mostly this has served to remind me how much SFV’s music heightens my emotional responses to matches. There’s just something about those musical stings and theme songs that invites you in. Without the music, the matches feel clinical and empty. Here’s another odd choice: Eleague’s tournament bracket system for the event, which risks player burnout and viewer boredom. Each group participates in a round-robin; yesterday, we watched Group A battle, with each player fighting against every other player individually, adding up to seven matches each. This is in contrast to, say, a double-elimination tournament where players only have to lose a couple matches before getting eliminated, and only the players who win have to go on to fight several matches in a row. Round-robin tournaments aren’t inherently boring. Exciting matches can certainly result from a layout that demands every single player face off against every other player in their group. It’s a guarantee that certain rivalries will get to be seen, for example, so it makes sense for Eleague to have set up their show in this way. However, the round-robin style does no favors to any player who might be having an off day, like Ricki Ortiz, who lost all seven of her matches yesterday. Unfortunately, Eleague’s decision to stick with the round-robin format can’t be changed at this point. While some fans might point to the nerfs of Ortiz’s main character, Chun-li, as the reason for her struggles, I don’t think that explains her painful seven-string loss. That’s the type of failure that can best be explained by someone having a one-off bad day, which happens to players in every sport from time to time. However, in a double-elimination tournament set-up, Ortiz would have only had to play two matches before getting eliminated and keeping her dignity intact. (Premiere fighting game events like Evo and the Capcom Pro Tour, for example, use a double-elimination bracket for SFV.) At Eleague, she had to keep playing all seven matches—even at the very end, after it was mathematically certain that she would be eliminated and wouldn’t recover. Talk about demoralizing, both for Ricki Ortiz and for every viewer tuning in. Unfortunately, Eleague’s decision to stick with the round-robin format can’t be changed at this point, no matter how boring it might be to watch as preliminaries go on. Gootecks, for example, seems unlikely to win any of his matches either, given that he’s more of a “celebrity” pick. So, at Group C’s broadcast, we might have yet another painful seven rounds of losses to endure. Of course, this same problem could happen to any player who just so happens to be having an off day—even a great player like Ricki Ortiz. Since both of the bottom two players get eliminated from each group, any player who loses six matches is already screwed. The seventh match just seems like humiliation overkill, but it must be done for the sake of completing the round-robin for each player. The entire vibe will change as soon as live audiences hop in the mix. That’s not something about the viewing experience that will improve. But we might see some other aspects of Eleague’s set-up change. For example, I wouldn’t be surprised if the commentators drop their understated, nervous attitudes after a while and get back to using the FGC slang that fans are used to hearing from them. Sure, it might alienate some members of the potential audience (e.g. “esports” fans who have never seen a fighting game tournament before), but it’s also part of what makes FG tournaments fun to watch and experience, and it’s sad to see those personalities getting papered over in these preliminary matches. I’m hoping that’s due to nerves about the Eleague event and its commentary-heavy set-up, and that eventually, the commentators’ personalities will shine through more. I also predict the entire vibe of the tournament will change as soon as live audiences hop in the mix. We’ll have to wait for the Friday night rounds to see and hear them, but the atmosphere of the broadcast will doubtless heighten as soon as commentators and players can play to the crowd and riff off of what’s happening in the tournament hall around them. For example, the taunting between Punk and Marn seems like it would’ve played out very differently if a live audience had been screaming in encouragement. At the very least, until the live audience shows up, Eleague should turn up the damn music. Because, come on. It’s a tournament, not a funeral.